Interest is charged on a loan at a commercially reasonable rate set annually by the New Jersey State Treasurer. For eligible borrowers, the interest rate for loan applications received in 2019 is 7.75% per annum on the declining balance of the loan. An administrative processing fee also applies to all pension loans. The administrative processing fee is $15.00 per loan. The interest rate for 2019 is determined using the Prime Rate (5.25%) plus 2.5%. The administrative processing fee is set annually and is based on the actual costs associated with administering the pension loan program. The loan interest rate is fixed annually, so if you borrow in 2019 you will have the same interest rate for the life of your loan unless you borrow again after the 2019 calendar year has ended. Every time a member borrows against their available loan balance, the entire outstanding balance is re-certified for the current year's interest rate. A member’s employer is late submitting the Quarterly Report of Contributions. In these cases ONLY, a Certified Loan Application may be remitted. When using MBOS you can determine your eligibility to borrow, the maximum amount you may borrow, and calculate various repayment options. Upon application you will receive confirmation that your Loan Application is received along with the date your loan check will be mailed. All loans must be paid in 5 years! Current Internal Revenue Service regulations require that all loans taken have a maximum repayment schedule of five years. If you have an outstanding pension loan balance and plan to take another loan, you must repay the combined balance of the original loan and all subsequent loans within five years of the issuance date of the FIRST LOAN. You must have at least three years of service credit and contributions posted to your pension account. Pension credit is “posted” to your account on a quarterly basis. It normally takes 45 to 60 days after the end of a quarter for your membership credit to be posted to your account. You must be an actively contributing member. Only members who are actively working and making pension contributions may take a loan. If you have recently returned to work after a leave of absence without pay or have changed employers within the last six months, you must obtain a loan application from your employer, who must certify the bottom portion of the loan application that you have returned to employment. The minimum amount you may borrow is $50. Loans then increase in multiples of $10. You may borrow up to one-half of your posted pension contributions, up to a maximum of $50,000. The maximum is calculated by subtracting your highest balance due (without interest) during the prior twelve-month period from $50,000. All loans from employer-provided retirement plans add up to the highest balance due, including any other government plans sponsored or administered by a public sector employer in New Jersey. You must indicate if you have any additional loans on the MBOS application. Any amount that you receive over the maximum shall be reported to the IRS as a deemed distribution and subject to additional tax. You may borrow twice in any calendar year. This is determined by the date of the loan check, not the date of the request. For example, if you make a request for a loan on December 28, 2018, and the check is dated January 2, 2019, the loan is considered your first for the year 2019. The minimum deduction toward repayment of any new loan is equal to the normal pension contribution rate of your salary at the time you apply for the loan. Usually, your minimum loan repayment amount will be the same whether you borrow $500 or $5,000; however, the repayment of a larger loan will continue for a longer period of time than for a smaller loan. IRS regulations require that all loans have a maximum repayment schedule of five years. If you take additional loans before the original loan is completely paid off, you must pay them all off by the first five-year end date. If you have an outstanding loan balance and wish to take another loan before your current balance is paid off, you may still apply for a loan. Because of the five-year rule, however, the repayment amount may be a lot higher. It is also possible that the maximum amount you can borrow may be reduced, or the loan request may be rejected if the payroll deductions would be more than 25% of your pay. If you are not satisfied with the loan amount or the repayment schedule when you receive your check, you may cancel the loan by returning the original unmarked and uncashed loan check. By cashing the loan check you are agreeing to the loan amount and the terms and conditions of the repayment schedule. When a loan check is returned, the funds are deposited back into your pension account and any remaining loan balance will be recertified using the current interest rate. The returned funds may again become available to borrow after the next quarter is posted. IRS regulations require members to make timely payments toward outstanding loan balances. If you take a leave of absence without pay for more than three months, you will be notified of non-payment toward the balance of your outstanding loan and offered the choice of making a lump-sum payment for the balance plus interest, or repayment of the loan in monthly installments through personal billing. The number of loan payments and the amount of interest due is based on continuous payments. If you are off payroll for any reason and your loan deductions are not taken as scheduled, additional interest will be added. 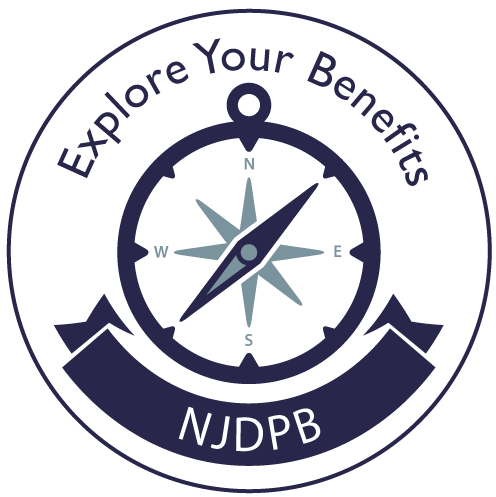 It is important that the NJDPB is notified immediately upon your return to payroll so your loan plus additional accrued interest can be recertified. Failure to notify the NJDPB in a timely manner will cause additional interest to accrue. Failure to repay a loan as scheduled may result in the unpaid loan balance being declared a taxable distribution. If the loan is determined to be in default, the loan will be considered a distribution from your pension account and reported to the IRS. For the tax year in which the default occurs, the NJDPB will send you a Form 1099-R for tax filing purposes in January of the following year.